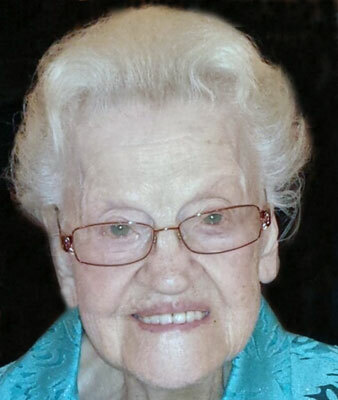 BOARDMAN - Virginia Paula Meshot, 101, passed away on Jan. 9, 2019, at Antonine Village in North Jackson. Virginia was born May 30, 1917, in Dayton, the daughter of James and Elizabeth (Nepfer) Shirley. Prior to retirement, Virginia worked at Packard Electric as an assembler for 28 years. She loved dancing with girlfriends at Maplerest Dancehall, solving the daily crossword puzzle, politics, camping, her soaps, and crafting beautiful handwritten notes to her adoring grandchildren and great-grandchildren. An avid sports fan, she cheered loyally for the Buckeyes, Browns, Cavs., and her favorite horses seeking the Triple Crown. Through her quick-witted humor, Virginia always brought smiles to the faces of everyone she touched, especially her family. Her love of life was always on display, never more so than when she sang and danced at her 100th birthday party. Virginia is survived by her daughter, Leilani (Douglas) Drake of Boardman; her grandchildren, Heather (Dave) Celona of Columbus, Douglas (Teresa Butler) Drake Jr. of Boardman, Danielle Drake of Boardman, and Jonathan (Michelle) Drake of Boardman; eight great-grandchildren, Nick, Matt, Daniel, Courtney (Kurt), Damon, Landon, Tyler, and Taylor; and four great-great-grandchildren, Amara, Zaden, Izeyah, and Dominik. Besides her parents, she is preceded in death by her siblings, George Shirley, Beatrice Hayden, Claudia Betts, Delores Robinson, Robert Shirley, and Virgil Paul Shirley. The family will receive relatives and friends from 11 a.m. until the time of service at the funeral home. A funeral service will be held on Sunday, Jan. 13, 2019, at noon at the Lane Family Funeral Homes, Canfield Chapel. Please visit www.lanefuneralhomes.com to view this obituary or send condolences to the family.